President Trump’s unprecedented arrangement for leasing the federally owned historic building that is now his international luxury hotel continues to draw legal challenges as quickly as it has drawn VIP guests from around the world. On Monday, days after a Time magazine cover featured a story titled “The Swamp Hotel” about potentially “dizzying” conflicts of interest, two state attorneys general joined an array of others in hitting Trump with a lawsuit. 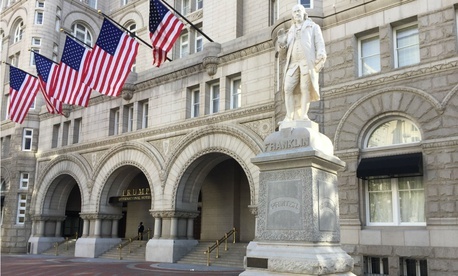 As first reported in advance by The Washington Post, District of Columbia Attorney General Karl Racine and Maryland Attorney General Brian Frosh—both Democrats—filed a suit in U.S. District Court in Maryland saying that Trump has violated anti-corruption clauses in the Constitution by accepting millions in payments and benefits from foreign governments since moving into the White House. They cited “unprecedented constitutional violations” and argued that Trump’s continued ownership of a worldwide business empire has rendered him “deeply enmeshed with a legion of foreign and domestic government actors,” which undermines the integrity of the political system. The attorneys general suit follows a separate challenge filed in January by the nonprofit Citizens for Ethics and Responsibility in Washington seeking an injunction, and a Superior Court suit brought by Washington restaurants claiming damage to their livelihood from the Trump hotel’s competition. The arguments of the attorneys general and CREW center on the Constitution’s seldom enforced Emoluments Clause, which prohibits U.S. office holders from taking gifts from foreign leaders without Congress’ permission. The General Services Administration, after much back and forth with outraged members of Congress, in March determined that Trump’s arrangement—in which he agreed to donate profits from foreign government guests staying at the hotel to the Treasury – was in compliance with the lease. The Trump Justice Department on Friday night filed a motion to dismiss the CREW Suit. The 70-page argument --harking back to 18th century case law- warned that an injunction would hinder the president from performing his duties and subject him to “prolonged litigation over any number of transactions.” It said “Congress is far better equipped than the court” to address the situation, and questioned CREW’s standing to sue. “CREW’s allegations of injury amount to little more than CREW’s own value judgment about what issues warranted its advocacy,” the department said. CREW’s asserted injury, therefore, is entirely “self-inflicted.” The filing also raised questions about the ethics agreement signed by Obama administration Commerce Secretary Penny Pritzker, like Trump, a billionaire who retained vast holdings while in federal office.